To the Mountain! is an archaeologically accurate story based on evidence of ancient Maya life. Here, we provide archaeological background to the story and to our understanding of ancient Maya people. Many people and websites refer to the cultural group that lived in modern-day eastern Central America as “Mayans.” However, archaeologists distinguish between the Maya people or the ancient Maya culture and the Mayan language. In archaeology, the term “Mayan” is only used to refer to the language spoken by Maya people. To the Mountain! is set during the Late Classic period (600 – 900 CE) in the Mopan Valley region of the Southern Lowlands (see map above) and modern-day Belize, Central America. Across the Maya Lowlands, the Late Classic was a period of dense population, elaborate art, and long distance interaction. Long before the Classic period, Paleoindians and the Archaic ancestors of the Maya lived in this area starting around 12,000 BCE. Around 3000 BCE, we begin to see the earliest Maya groups in small settlements. This is the beginning of the Preclassic period (3000 BCE – 250 CE). The Classic period spans from 250 – 900/1100 BCE depending on the area under study. Thereafter, the Postclassic period continued until approximately 1500 CE. The Contact and Colonial periods were initiated by the arrival of Spanish seafarers into Central America in the 1500s. You can learn more about the ancient Maya timeline here. Historic people living in the Mopan Valley region of modern-day Belize have always known about and sometimes lived at ancient Maya centers. By the late 1800s, British colonists and others became interested in Maya buildings and artifacts. Sylvanus G. Morley (pictured below) and Thomas W. F. Gann were two early investigators in the Mopan Valley area. 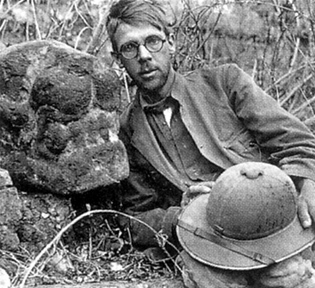 Like many explorers who called themselves archaeologists, Morley and Gann often used very destructive methods, only paid attention to monumental remains, and removed finds from their original locations. As a result, many ancient Maya artifacts from the Mopan Valley ended up in European or American museums. Modern archaeology has come a long way. Portrayals in popular culture, such as the Indiana Jones films, do not do justice to the scientific rigor and social import of archaeology today. You can learn more about modern archaeological ethics here. Little Moon and Running Jaguar come from the Chan community. Chan is an archaeological site and was an ancient community located to the southwest of modern Succotz village and Xunantunich in Cayo District, Belize. The Chan hilltops were home to many families with farms of terraced fields. Terraces were built to transform hills into small platforms to trap water and make sure crops can grow well in the tropical environment. Dr. Cynthia Robin, her staff, and many experienced local excavators from Succotz and nearby Benque Viejo del Carmen excavated at Chan over many years. They found that the farming families at Chan were close knit, relatively equal, and they productively sustained themselves without destroying the surrounding environment. You can find more information about Chan in Dr. Robins’ book called Everyday Life Matters: Maya Farmers at Chan, available online or at the Succotz Public Library. As an introduction, the chapter titled “Everyday Life at Chan” is a good place to start. Clay Mountain, or Katyaatz Witz in Maya, in the story refers to the archaeological site of Xunantunich that was an important place in the Mopan Valley region during the Late Classic period. Xunantunich sits on a hilltop over the Mopan River. It was a medium sized political center (or city) where people lived and celebrated important days of the year. 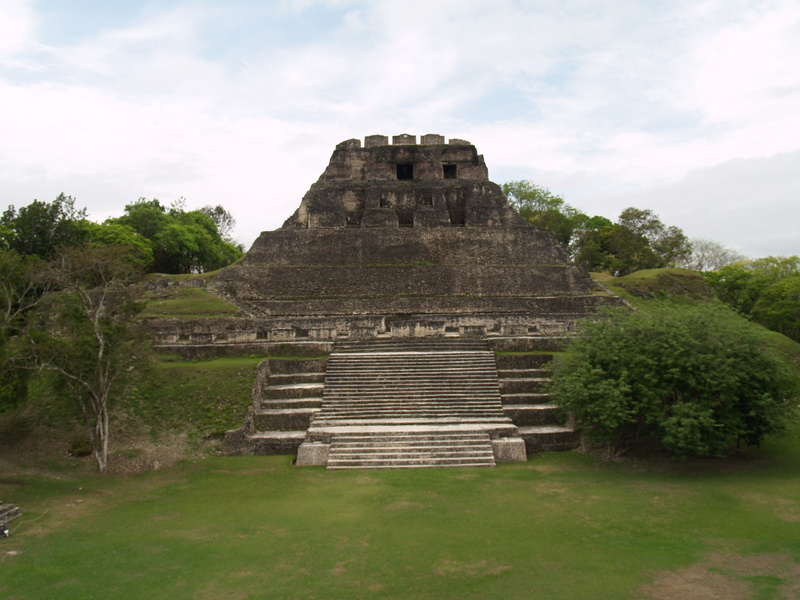 You can learn more about Xunantunich and the archaeological investigations that have occurred there in Dr. Lisa LeCount’s and Dr. Jason Yaeger’s book titled Classic Maya Provincial Politics: Xunantunich and its Hinterlands, available online or at the Succotz Public Library. As an introduction, the chapter titled “A Brief Description of Xunantunich” is a good place to start. We have archaeological evidence of buildings and artifacts that date to the Preclassic period (and before) at the site. In these early days, many activities occurred at Group E or what Dr. Kat Brown calls “Early Xunantunich,” outside of the later central area. Early Xunantunich was not as large or powerful as other cities in the area such as Actuncan or Buenavista. On page 23 of To the Mountain!, Little Moon, Running Jaguar, and their new friend Mim walk from the river staircase on the sacbe (or white road) “passing by temples built many generations ago.” These early buildings are those of Group E and Early Xunantunich, situated to the east and at a lower elevation than the later central area. By the Late Classic period, the rulers of Xunantunich became quite powerful and may have formed alliances with a larger city called Naranjo, located in modern-day western Guatemala. The communities around Xunantunich, like Chan, likely helped to build the monumental buildings within the city during this period (see map below). Father of Little Moon and Running Jaguar in To the Mountain! is participating in one of these building projects. In particular, the architectural feature highlighted in To the Mountain! is the El Castillo acropolis (pictured above; see map below) and the central building of the acropolis, known as Structure A-6. In the Late Classic Hats’ Chaak period when To the Mountain! takes place, builders were constructing the second version (or phase) of Structure A-6 and we call this Structure A-6-2nd. We illustrate Structure A-6-2nd on pages 33 and 37 of To the Mountain! Structure A-6-2nd was an important ceremonial building at Xunantunich and incorporated a monumental stucco frieze that proclaimed kingly power, divine connections, and earthly dominance. It wrapped around all four sides of the building’s roof panel with multi-colored decoration that would have been visible across the landscape around the hilltop. On page 37 in To the Mountain! a reconstruction of the frieze is included, showing how brilliant and colorful it would have been. Today, it only survives in fragments (see drawings below) and is protected by fiberglass replicas on the east and west side (see photo of eastern frieze replica below). Little Moon, Running Jaguar, and Mim also visit the busy Clay Mountain, or Xunantunich, marketplace. 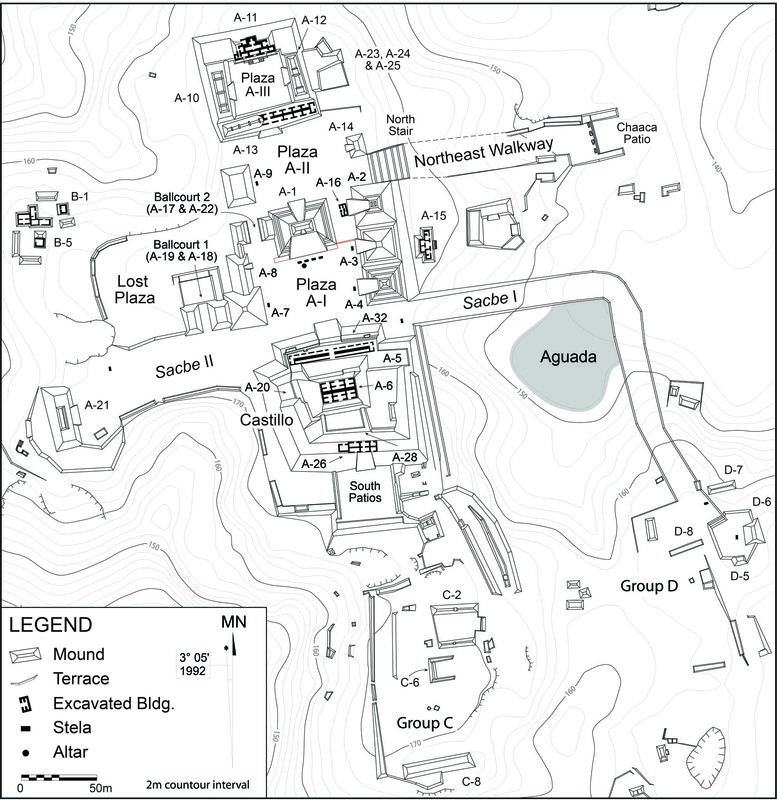 Dr. Angela Keller suggests that the “Lost Plaza” area on the west side of the Xunantunich center (see map below) would have housed a marketplace where people bought and sold stone tools (like obsidian blades as in the story), ceramic vessels, spices, and other more exotic goods such as shells. Dr. Bernadette Cap suggests that the marketplace at Buenavista, a nearby site in the Mopan Valley area, hosted sellers working on their products while selling. We incorporate these ideas into To the Mountain!